GHS David Gilmour Signature Boomers are the world’s “Best Electric Guitar String” as per the M.I.P.A. International Press Awards, otherwise known as the “Grammy” of the Music Instrument/Pro Audio Industry. More than 100 magazines from all over the world got together to vote the BEST products of 2008/2009 and the award was presented at a special Awards Ceremony in Germany at the recent Frankfurt Musikmesse. Voting publications included Guitar Player Magazine, Guitar World Magazine, and 98 others from around the world. GHS has enjoyed a long time relationship with Pink Floyd guitarist, David Gilmour, dating back to their famous album, “The Wall”. There are two sets of the David Gilmour Signature Strings with one set designated for use with Gibson guitars (Red set) and the other for Fender® Stratocaster® guitars (Blue set, which is offered here). They are the same strings used by Gilmour and designed to meet his specifications. 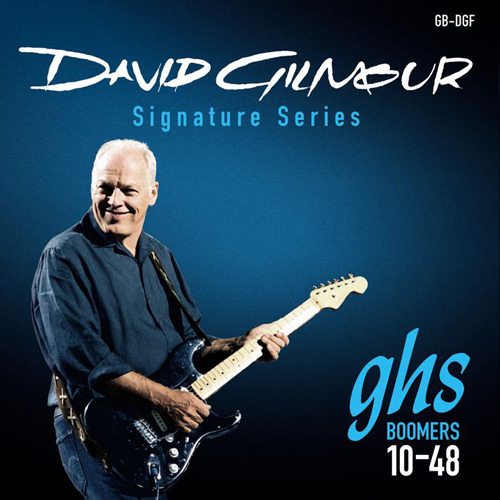 GHS company President, Russ McFee stated, "We are very proud to have our David Gilmour Boomers selected as the best guitar string in the world by such a prestigious and large group of publications." David Gilmour's connection with GHS' Boomer series electric guitar strings goes back to 1979, when he started using them on Pink Floyd's "The Wall" project. The GHS David Gilmour Signature Blue Set Electric Guitar Strings offered here feature 10-12-16-28-38-48 string gauges.